The Internet is full of articles warning you of the dangers of credit cards. But they’re only dangerous to the people who abuse them and who lose control of them. Consider getting a Capitec credit card. On the other side of the coin, a credit card that is well managed can be a powerful tool. If you had to pay for everything in cash, you’d never own anything really, and a credit card can open the door to owning some pretty useful items such as computers, fridges and clothing. Have you had a job interview with no money to spend and a credit card has come to the rescue? It enabled you to buy an important clothing item so you could ace your interview with confidence. Owning a credit card means understanding your credit card statement. Understand how the minimum payment amount works and knowing where to check for the date on which to pay the amount due. Capitec Bank offers a versatile credit card, and as a retail bank licensed by the Reserve bank of South Africa, you’ll want to know about their wonderful credit card. Capitec is a bank that is regarded as one of South Africa’s leading banks and it is also looked upon as the best in the world. The bank has been awarded Lafferty Group’s highest 5-star rating – the only bank in the world among those rated to get a 5-star rating. The bank also achieved a record growth of 1.3 million new clients for the financial year to February 2017. When you see the shiny gold credit card from Capitec Bank you’re going to feel like a VIP and be the envy of anyone who sees it. 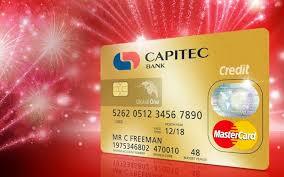 Capitec Bank believes that with this credit card, it will feel as though life gets a lot easier for you.